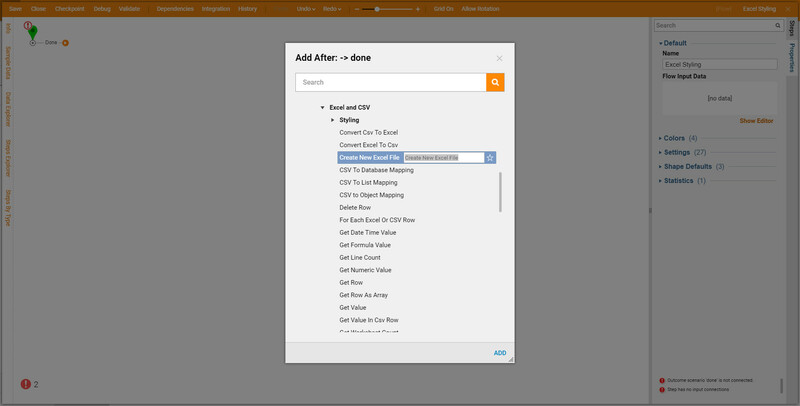 This tutorial demonstrates how to Create an Excel Document	in the Flow . Additionally, this tutorial demonstrates how to apply different Styles	to this Excel Document . 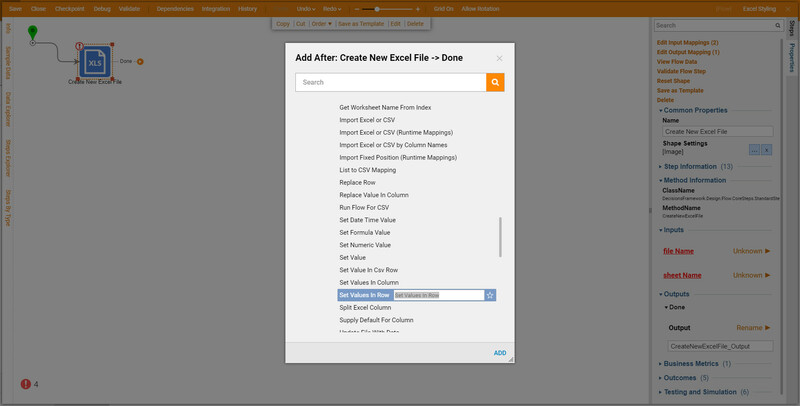 Create New Excel File	step can be found underData > List > Excel and CSV	category in the ToolBox	in the Flow Designer . Different Style Steps	that can be applied to the Excel Document	located in the Data > List > Excel and CSV > Styling	category in the ToolBox	. 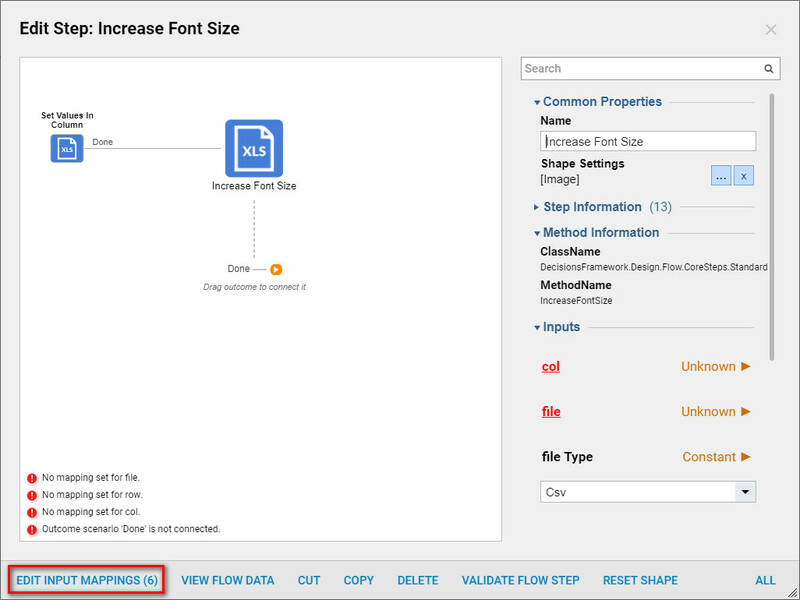 Next, we name our Flow and click Create	to proceed to the Flow Designer. 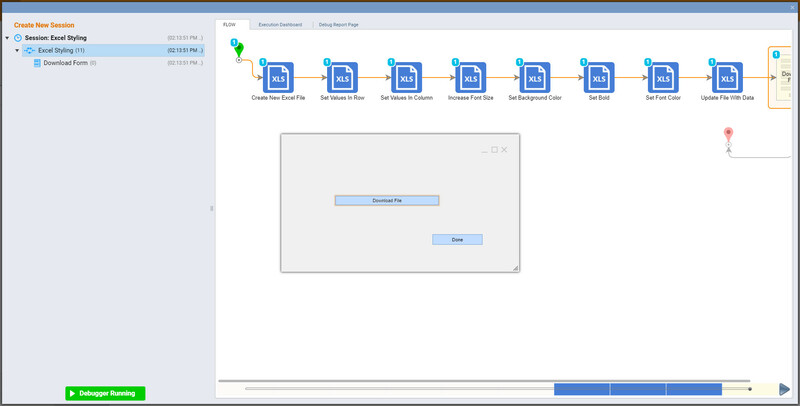 In theFlow Designer we use Flow Designer Wizard	to add Create New Excel File	step from All Steps [Catalog] > Integration > Excel and CSV	category. 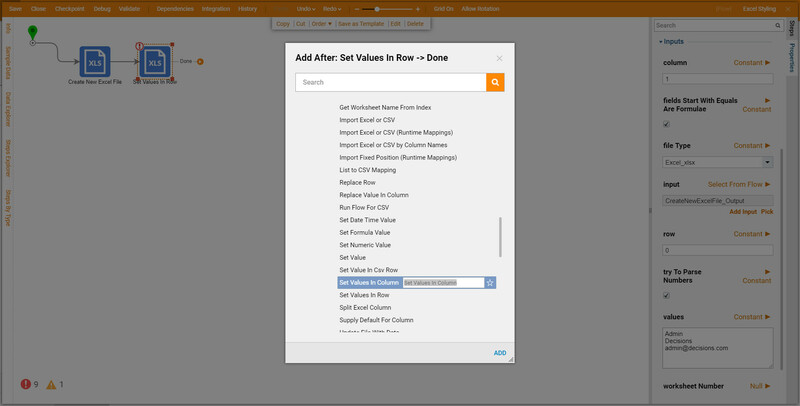 Next, we add Set Values In Row	step from the same category in the Flow Designer Wizard. Then, we select Create New Excel File	step on the workspace and configure it using Inputs Layer. We select Constant	Mapping type	for fileName	and sheetName	fields and provide these fields with desirable Values	. In the properties panel we map data to the Set Values in Row	as follows. 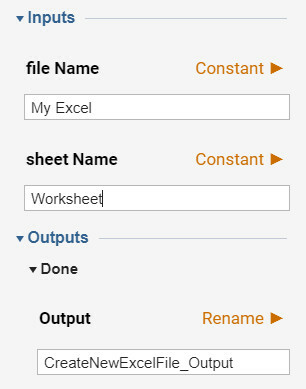 We use the Excel File	that was created in the First Step in our Flow as an input field. Other fields defined Constant	. 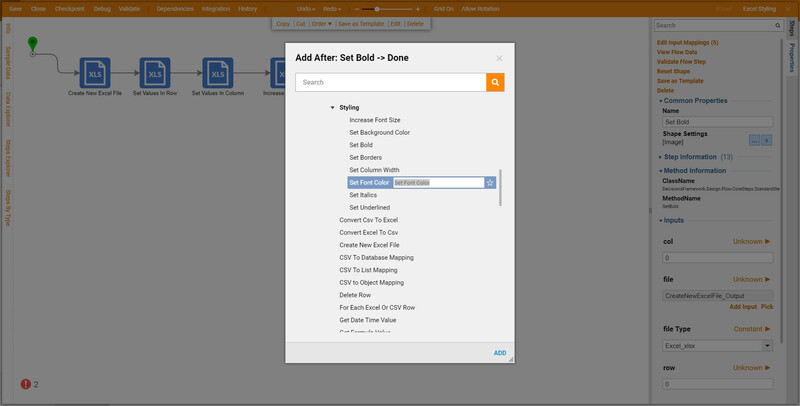 Then, we click Ok	to save and close Mapping Editor. 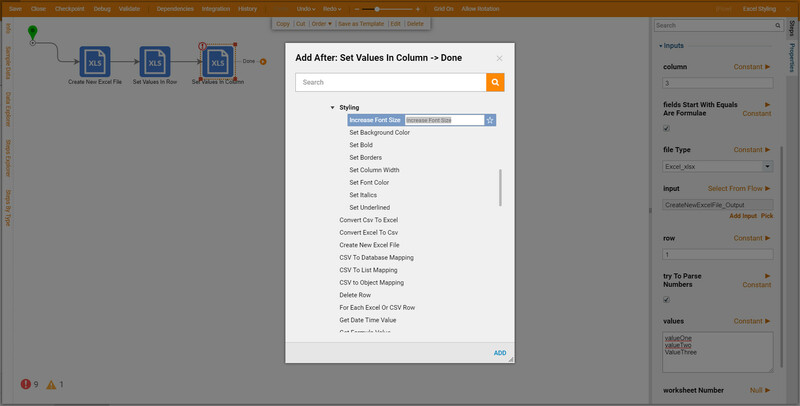 Back in the Flow Designer we add Set Values In Column	step from All Steps [Catalog] > Integration > Excel and CSV	category. 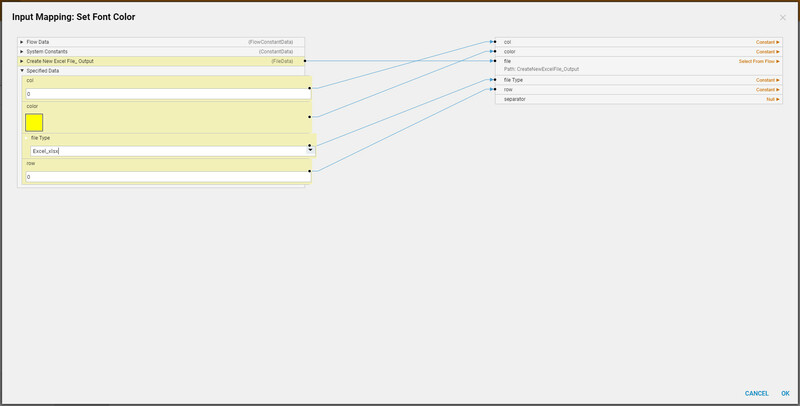 Next, in the properties panel we map data for this step in the similar manner we mapped data forSet Values In Row step. Next we are going to apply some styles for our Excel Document. 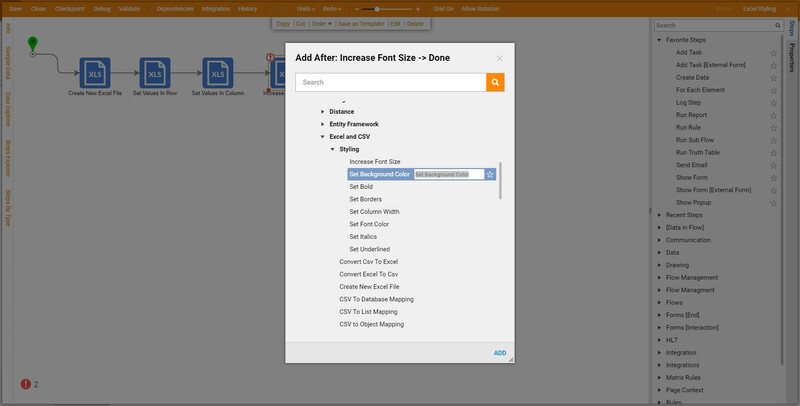 We expand All Steps [Catalog] > Integration > Excel and CSV > Styling	category in the Flow Designer Wizard and add Increase Font Size	step to our Flow . We open Mapping Editor for this step. 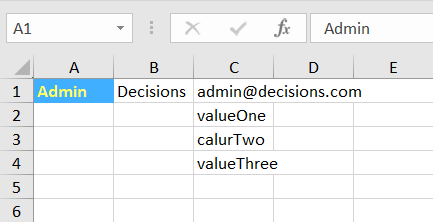 In the Mapping Editor we connect file field to the Excel File that was created in the First step in our Flow . We define other fields Constant	and provide them with desirable Values	. Click Ok	to close and save Mapping Editor. 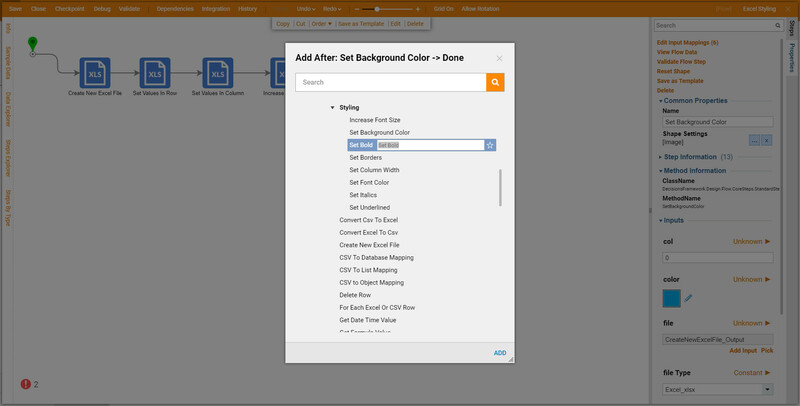 Next, we add Set Background Color	step from All Steps [Catalog] > Data > List > Excel and CSV > Styling	category. And map data in the following manner using Mapping Editor. From the same Styling	category, we add Set Bold	step. 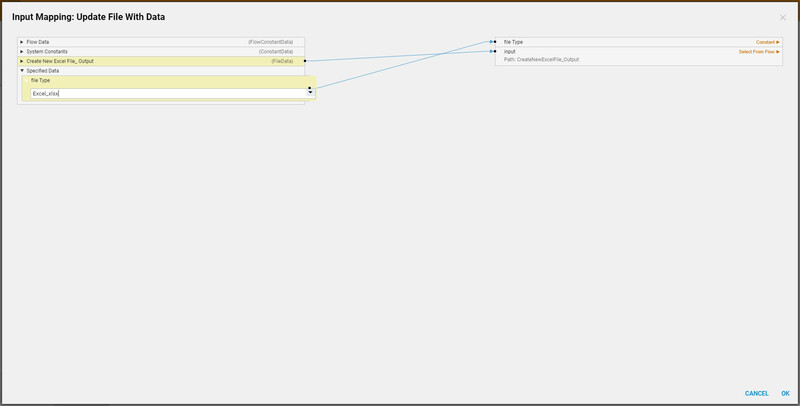 Then, we call Mapping Editor a nd map data for this step. Finally, we add Set Font Color	step from Styling	category. Open Mapping Editor a nd map data. Every time we make changes to the Excel File in the Flow we need to update it. 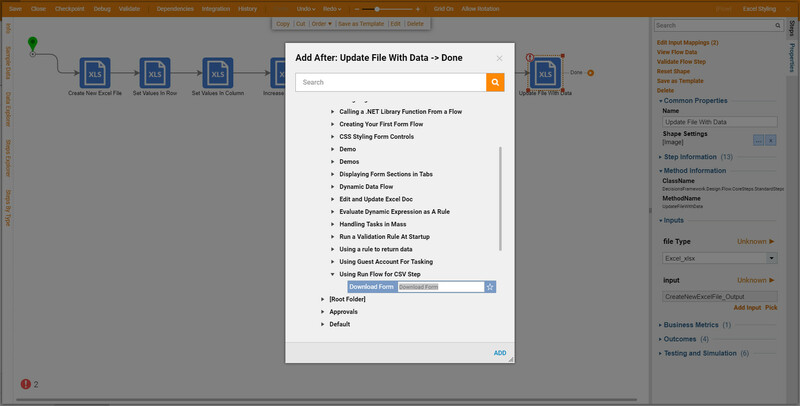 For this purposes we add Update File With Data	step from All Steps [Catalog] > Integrations > Excel and CSV	category in the Flow Designer Wizard. We open Mapping Editor for this step and map data in the following manner… We use the Excel File that was created in the First step in our Flow as an input	field to this step. When finished, we save and close Mapping Editor. 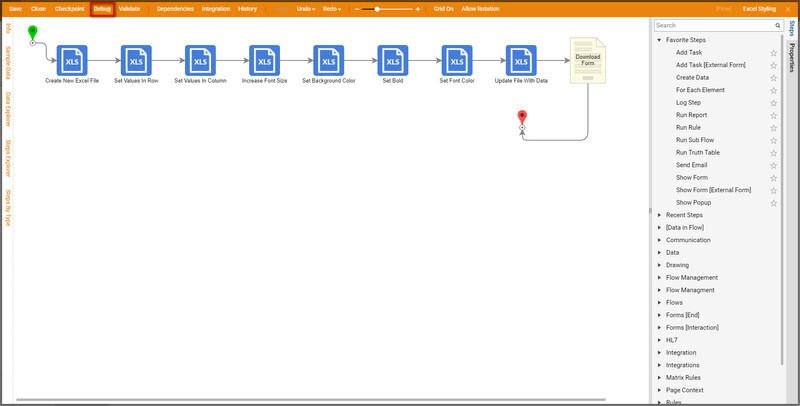 Lastly, we add Download File Form	step from Flows, Rules, Forms and Reports > Forms[Interaction] > [Parent Folder] > Using Run Flow for CSV Step	category in the Flow Designer Wizard. This Form was predesigned for this tutorial. It simply has an Action Button	control andFile Download	control. It was designed for user to be able to download the Excel Document that we have created. 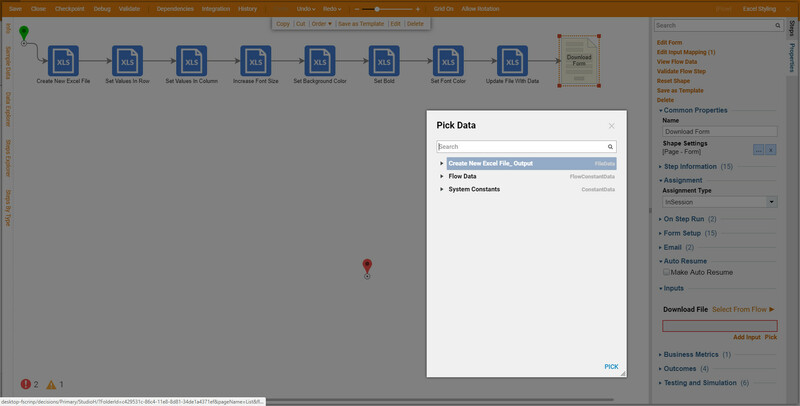 Next, we select this Form step on the workspace and configure data mapping using Step Information Layer. 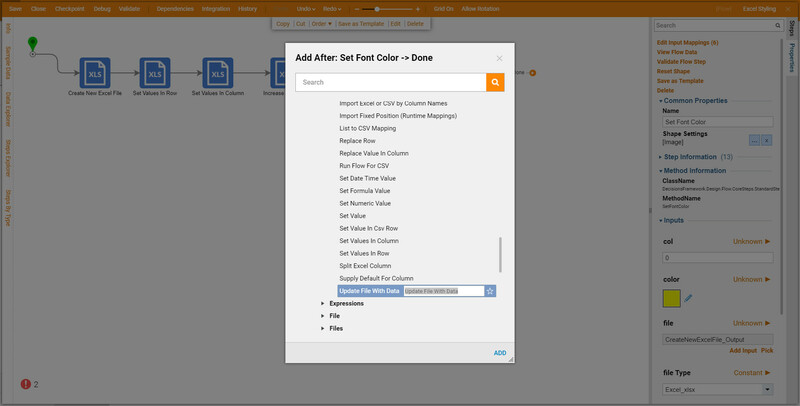 For Download File	Mapping type	we choose Select Value	. 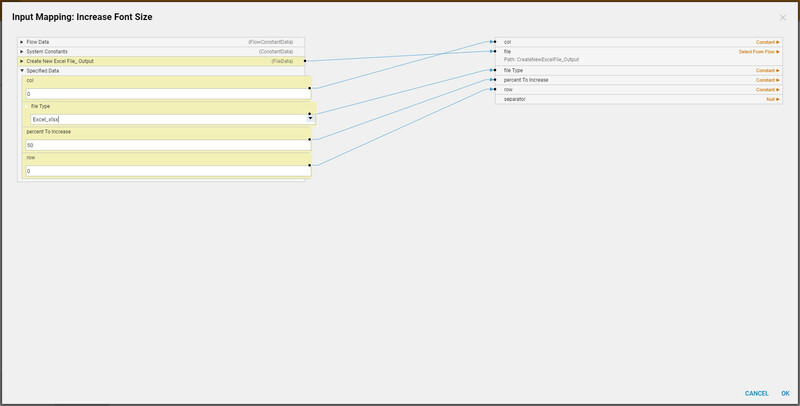 Then, using Value Picker	we select the File	that we have created in the First Step	in this Flow . We connect all steps in the Flow as follows… This completes our Flow . 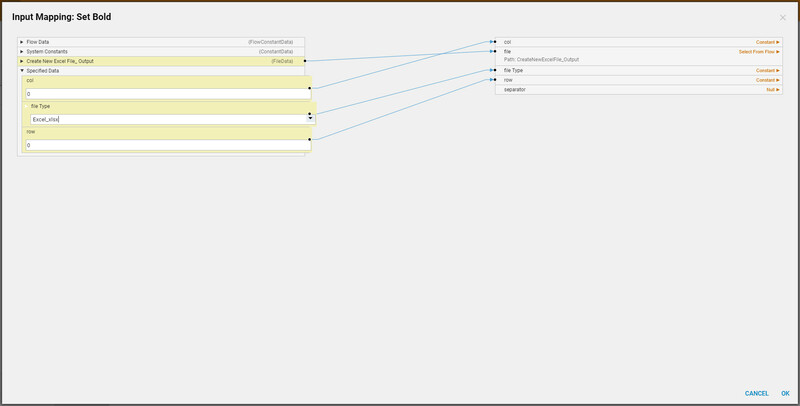 We can clickDebug	link from the Top panel of the Flow Designer to test our Flow . When our Form opens in the Debugger	we clickDownload File. We confirm that we want to save the File . Then, we select the location for our File , Name it and Save	. 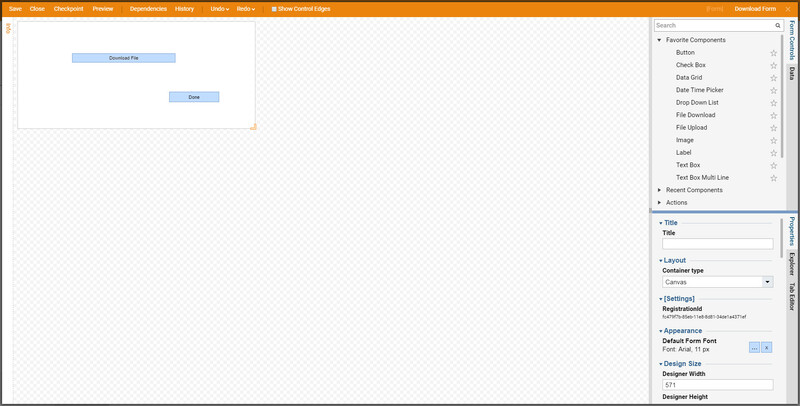 And we click Done	button on the Form in the Debugger	to close the Form . 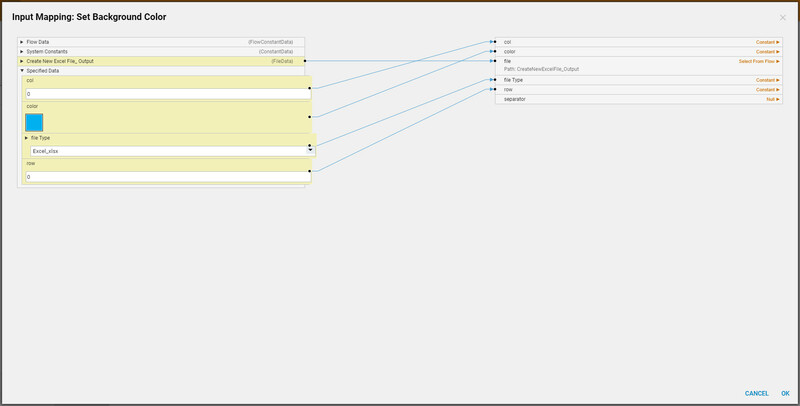 Flow Diagram in the Debugger	indicates that our Flow ran to the End Step	with no errors. Next, we can locate and open Excel Document to confirm that all the styles applied as we have designed.